The Fies Files: The Schulz Museum's 15th. I Got More Than A Rock. The Schulz Museum's 15th. I Got More Than A Rock. Cartoonists, Schulz Museum staff, and Schulz Studio staff gathered for a group photo at the end of the day. 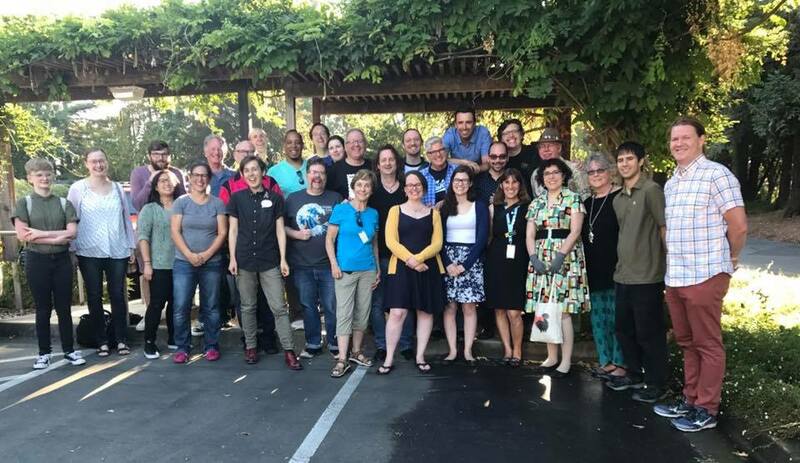 Somewhere in this photo are Svetlana Chmakova, Donna Almendrala, Maia Kobabe,Tom Beland, Denis St. John, Paige Braddock, Lex Fajardo, Andy Runton, museum education director Jessica Ruskin, Andrew Farago, Nathan Hale, Jeff Smith, Jeannie Schulz, Raina Telgemeier, and a lot of other fine people. Also me. Matching names with faces is left as an exercise for the reader. Saturday was a good day. 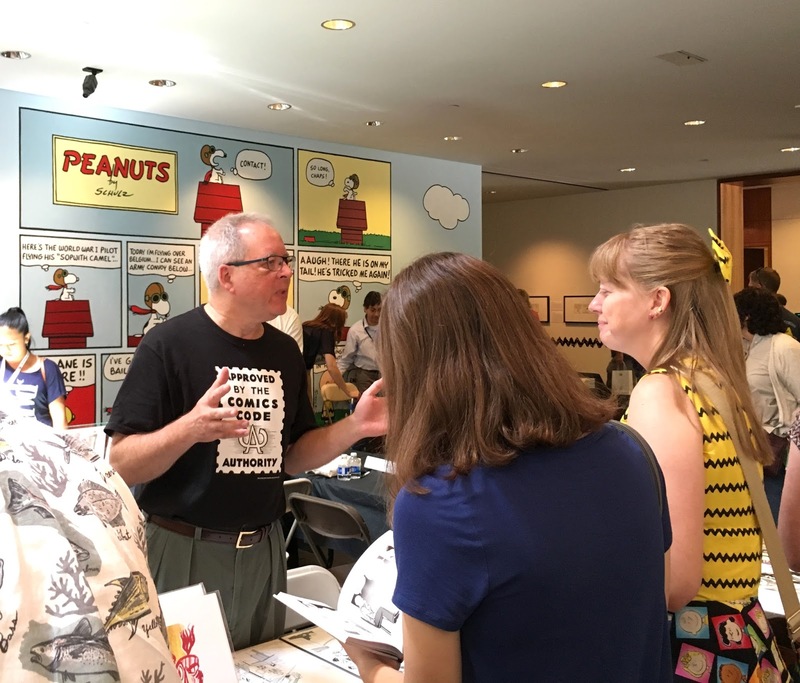 I got to help the Charles M. Schulz Museum celebrate its 15th anniversary. One of the museum's secret weapons is the impressive amount of cartooning talent within an hour's drive (which includes San Francisco), both working for the Schulz Studio and doing their own things. Virtually all of them grew up loving and influenced by Peanuts, so when the museum calls they answer. The celebration began with a talk by Jarrett Krosoczka, creator of the bestselling Jedi Academy and Lunch Lady series. 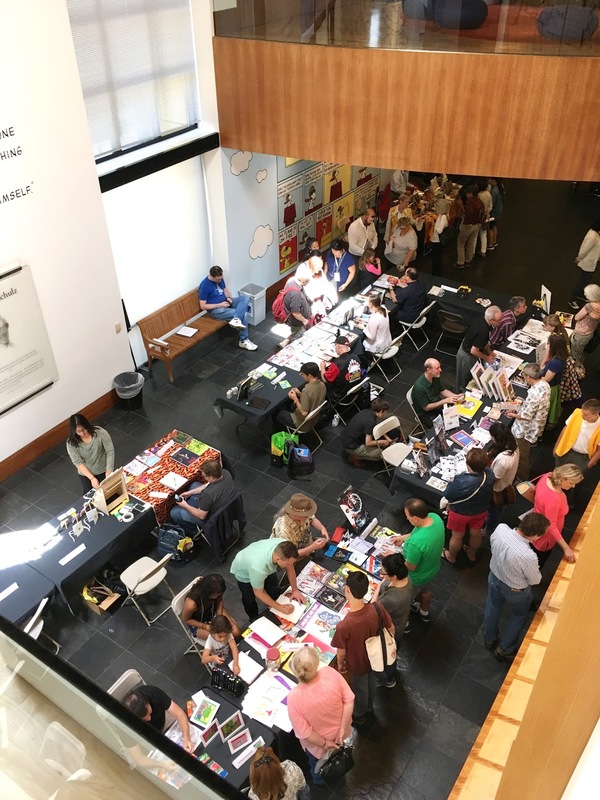 Honestly, I missed that part because I was setting up for immediately after, when folks got to meet more than a dozen cartoonists, including me, in the museum's Great Hall. A lot of these photos were shot by my daughters Laura and Robin, who are much better tablers and salespeople than I am. An overview of the Schulz Museum's Great Hall packed with cartoonists. I'm at center right in a black t-shirt with silver (sigh) hair. I loved that woman's dress and hair ribbon with the Charlie Brown stripes. Hard to see here, but her skirt was all Peanuts characters, too. Lots of great people in this shot. 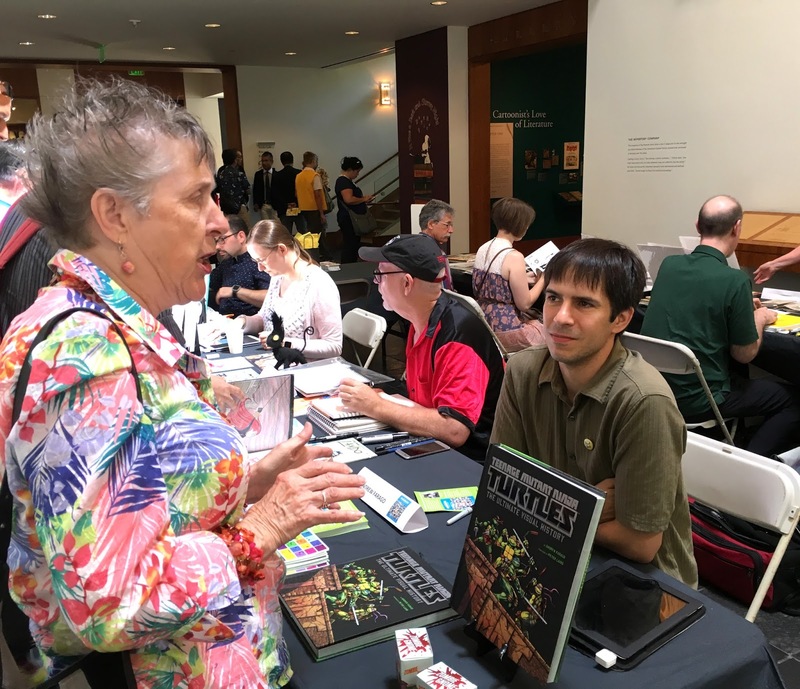 In the foreground is Rosie McDaniel, talking to author and Cartoon Art Museum curator Andrew Farago. Rosie is a very special lady whose important role in local comics is hard to describe: her late husband Mark Cohen was a comics collector and agent, Rosie has published a couple of books about comics, and she's on the board of the Schulz Museum. But mostly she's just Rosie, who knows and is loved by almost everybody. In the red shirt/black cap is Tom Beland, from whom I later bought a drawing. The woman sitting next to Tom is bestselling author Svetlana Chmakova, and beside her, just visible under Rosie's nose, is my pal Alexis Fajardo. In the background behind Tom Beland is "Prince Valiant" artist Tom Yeates, whom I'd never met but spent quite a lot of time talking with because I was sitting next to him, where my daughter Robin (purple dress) is filling my seat. Tom Yeates brought some original Valiant pages and I was impressed by how clean his artwork is--very little penciling or corrections. Very confident. 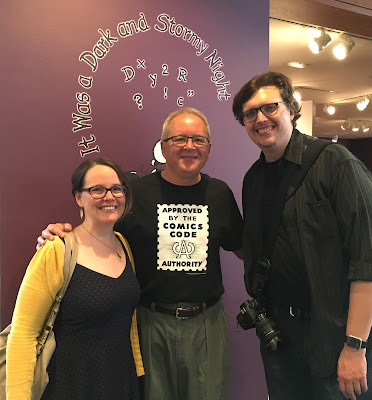 To Robin's right is "Atomic Bear Press" creator Brian Kolm. I added this charming drawing by Tom Beland to my small collection of original comics art. 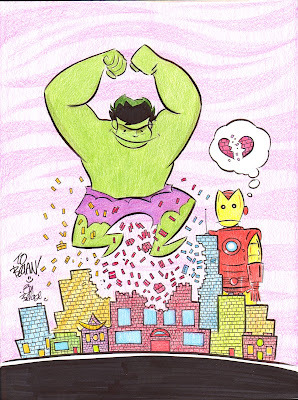 I think Iron Man is sad because the Hulk smashed his Lego town. I admire how elegantly Tom conveys form and line. It's hard to make it look that easy. From my perspective, I enjoy three benefits of doing events like this: I get to hang out with my cartoonist friends. I get to meet cartoonists I don't know. And I get to talk to nice people, especially kids, who really like comics and cartooning. Also, I get to sell a few books, though that's really not my main motivation. Let's call that another half a benefit. Three and a half. The Museum hadn't announced that bestselling graphic novelist and my comics buddy Raina Telgemeier would be appearing, so it was a surprise to most of us if not to her. She signed books for several dozen people whose days were made when they found her there. On my other side is cartoonist Andy Runton, whom I'd only met very briefly when he won an Eisner Award in 2006 for his series Owly. I really enjoyed talking with both of them. My friend Denis St. John from the Schulz Studio peddled his own work, promoted with his dazzling smile. Behind Denis in the hat is Astro City artist Brent Anderson. It's always nice to catch up with Brent and his wife Shirley, whom I usually run into at a local Farmers' Market because we live about six miles from each other. 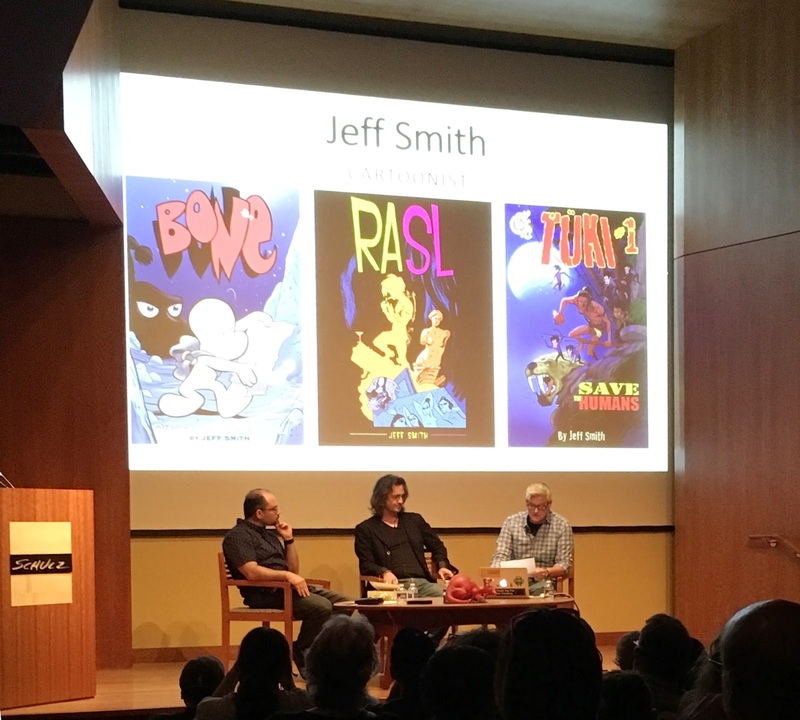 The event's guest of honor was Jeff Smith, creator of the hugely popular Bone series, now available in more than 30 languages worldwide. Jeff did an interview-style panel with the Schulz Studio's Paige Braddock and Lex Fajardo that covered pretty much all of his origin and career. Lex and Paige approached the job from different angles and managed to elicit answers Jeff probably hasn't given a hundred times before. It was a good panel, topped by Jeff being given the Cartoon Art Museum's "Sparky Award," named after Schulz for services to comics above and beyond the call of duty. Jeff seemed genuinely surprised and moved. It was a great moment. Lex, Jeff and Paige talking in the museum's little auditorium. After Jeff's talk, he signed books in the Great Hall, which was cleared of all the cartoonists' tables during his panel. That took him more than an hour. After the official event, all the participants were invited to walk across the baseball diamond and past the pumpkin patch to Mr. Schulz's studio, which is still the nerve center of Peanuts creative work and product licensing, for a pizza dinner. That's where I had a chance to talk with Nathan Hale, who does young-adult historical graphic novels for my publisher Abrams. We compared notes. The irony of a guy actually named "Nathan Hale" writing about Revolutionary-era America did not go unremarked, though I'm sure he's bone-tired of it. It took a lot of guts to ask Jeff Smith to pose for a selfie. 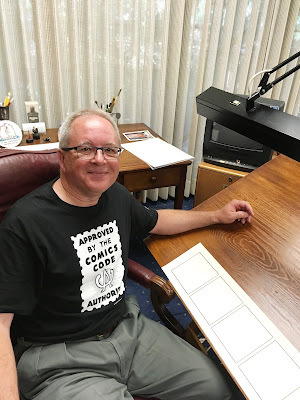 He had many people vying for his attention, but we managed to talk about our mutual artistic hero, cartoonist Walt Kelly, and what it's like to scrap a project and start over from scratch after you've already completed 100 pages of it, which we've both done. 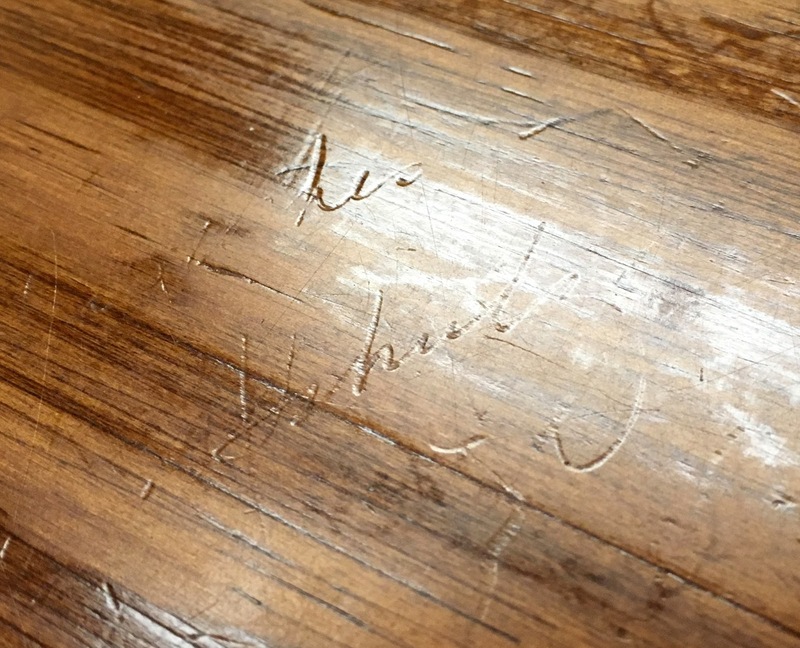 In the corner of the studio where Mr. Schulz used to work, his widow Jeannie set up his drawing table and chair from home (his original studio furniture is now exhibited in the museum). All studio tours for cartoonists end in this corner. Timidly, in hushed tones, they ask if they can sit in the chair. Yes they can. I've visited the studio a few times, and a couple of years ago even posted some pictures of me sitting in the chair, but I hope I never get so cool that I don't feel a little jolt of electricity when I get to do it again. I asked one of my friends who works at the studio whether that feeling ever wears off. They said they feel it fresh every time someone who's never been there before enters the room and their eyes go wide. In my friend's experience, only cartoonists really get it: sitting at that board is like walking into Camelot and grasping Excalibur. If you angle the light just right, you can see Mr. Schulz's lines and letters impressed into the soft wood of his drawing board. In fact, I think that reads "Schulz." 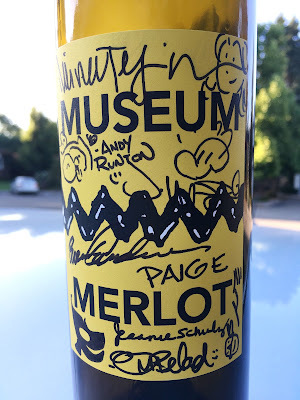 In addition to a variety of freshly fired pizzas and salads, the museum generously provided beverages, including bottles of "Museum Merlot" blended by Jeannie Schulz herself, according to the label on the back. 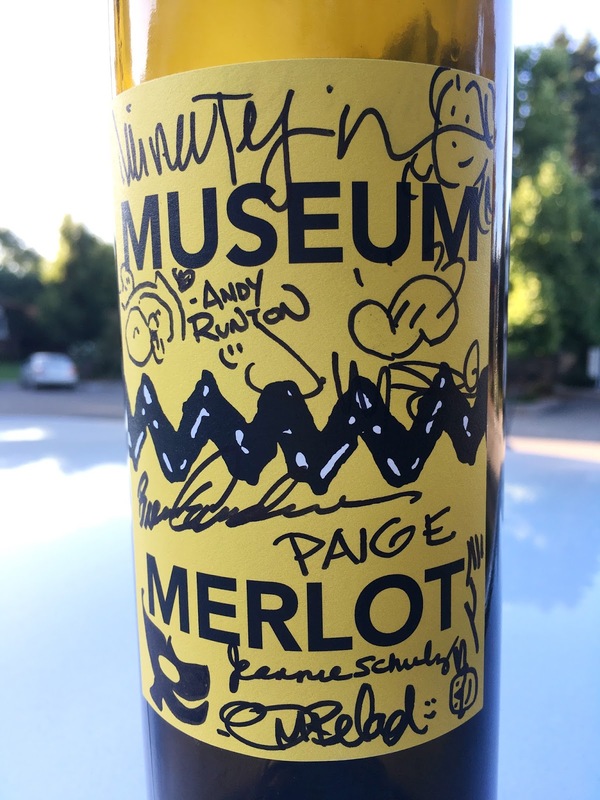 I helped empty one and seized my opportunity, taking home what I'm pretty sure is the only wine bottle in the universe signed by (top to bottom) Raina Telgemeier, Andy Runton, Jeff Smith, Brent Anderson, Paige Braddock, Jeannie Schulz, Tom Beland and, sideways at lower right, Nathan Hale. I'm embarrassed to say how much I'll treasure this. There's a big part of me that'll always be 15 years old and amazed that not only do I know people who make comics professionally--some incredibly successfully--but that I get to do it, too. It's a lonely business and there aren't a lot of people you can talk shop with. Events like these are great fun and the public seems to get a lot out of them, too. Thanks to the Schulz Museum for letting me come play with my friends. Eclipse 2017: Roadtrip to Infinity!